The charging bar ALS must be attached at a distance of approx. 10–20 mm above the material to be charged, directly above the counter-electrode. The grounded counter-electrode must make contact with the material to be charged. 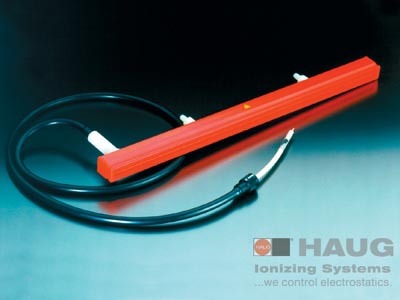 In order to achieve a continuous, controlled fixation of the two materials, we recommend that, before charging, the materials to be fixed to one another, be discharged using a suitable HAUG ionization system. The charging bar ALS is available both with axial and radial exit of the high-voltage cable. The high-voltage cable and the pin strip can be simply replaced. Aufbau Special synthetic material made to stand high-voltage, compact design, enclosed all round. Assembly screws M10 x 40, T-groove running the whole length of the bar, optimum installation possible.